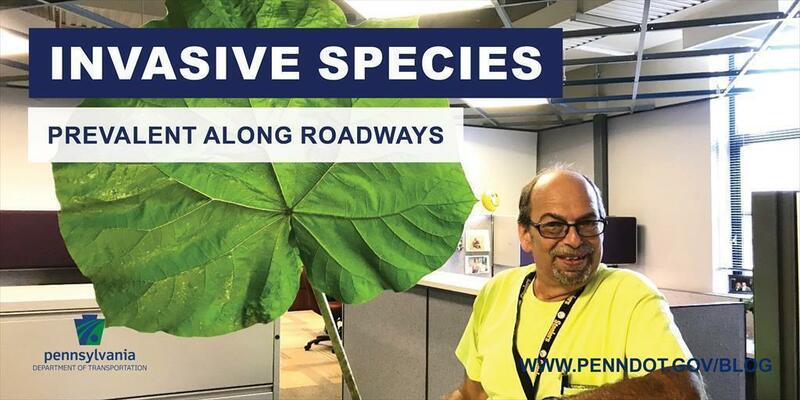 Jim Cessna — roadside specialist and professional arborist in PennDOT’s Harrisburg-area District 8 —deals with a lot of vegetation issues along our state roads, especially invasive and noxious plants and bugs. A young princess tree plant is seen along a roadway. Above, Jim Cessna of PennDOT holds up a princess tree leaf larger than his head. Cessna recently shared his latest find – a huge leaf from a princess tree found along Route 225 on top of Peters Mountain in Middle Paxton Township, Dauphin County. The princess tree — also called an empress tree, foxglove tree, or more formally as a Paulowina tomentosa — is a deciduous tree native to central and western China. It is an extremely fast-growing tree and is a persistent exotic invasive plant in North America. It was introduced to America in the 1840s. A Dutch botanist, who found the tree in China while working for the Dutch East India Co., named it after a Romanov princess, the Grand Duchess Anna Pavlovna of Russia. Cessna discovered the plan after being contacted by a concerned citizen who reported it as giant hogweed, which is also an invasive plant classified as a noxious weed. He discovered that it was a princess tree instead. It can grow to between 32 and 83 feet tall. Invasive species represent one of the most significant ecological threats of the 21st century. Invasive species are exotic plants and animals that have been intentionally or accidentally introduced into native ecosystems. These invasive species displace native species and change the ecological structure of the invaded community, sometimes with dire consequences to native plants and animals. PennDOT has taken the initiative to address invasive species within its rights-of-way by preparing guidance for its staff, as well as contractors working for the department, to help them address invasive species throughout the life of a project from design, through construction, and finally continuing ongoing maintenance. To report giant hogweed, use the toll free hotline: 1-877-464-9333. To report bad bugs, contact the Pennsylvania Department of Agriculture at 1-866-253-7189 or badbug@pa.gov. To report other invasive species, contact PDA at 717-772-5225.